Things haven't come easy for Brookfield Central senior guard Sam Rohde. 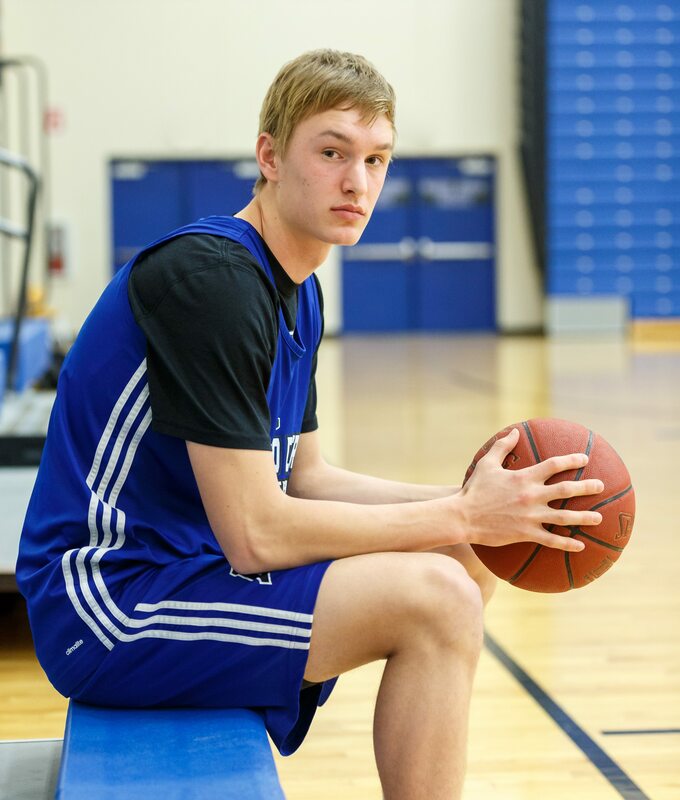 After excelling on the junior varsity as a freshman, Rohde stepped into the starting varsity point guard position as a sophomore, only to see his season end 12 games later with a broken left ankle.
" He was probably our best player," Central coach Dan Wandrey said. "but the injury set him back. We had older kids when Sam was a sophomore, who put themselves in situations that Sam never did. Those are things that are hard to teach." Despite the injury, Rohde topped the team in assists (3.9 per game), was second in free-throw shooting (.825 per cent) and 3-point percentage (.471), while finishing third in scoring (7.6 points per game). Sam talked about the role Wandrey wanted him to play. "If it helps the team I was ready to play point guard, shooting guard, wherever he wanted me to. That's what you got to do." Rohde recalled how his teammates helped out, even though he was a sophomore and had to play point guard. "The team was really accepting," he said. "That helped me out a lot. It's harder when you're at a younger age to run the show. But as you get older, play the games, get used to the guys your playing with you get a feel for what your teammates are like; how you can distribute the ball, make plays." Rohde hated to see his season end with the injury. "It was really tough," he said. "I liked what we started to do as a team. I had a lot of fun with the guys. It was just tough to think about it, getting to that point of the season, the playoffs coming up. Then have it all end. I still went to all the practices, but I was on crutches for six weeks." "When you are watching from the bench, you can see all the aspects of the game," he said. "I didn't take things for granted, but I appreciated it more." Coincidentally, Wandrey coached Sam's sister, Lydia Rohde, who has gone on to play basketball at Northwestern University after an outstanding career at Central. "Obviously having coached Lydia, they were very similar," Wandrey said. "They have an instinct, a knowledge, an IQ of the game. They are a little wise beyond their years. I think you only get that from being around it, watching it and studying it. You have a feel for the game. "It's basketball, it's like a higher level processing there. He was always a really good ball handler, a very good passer, a distributor, he had a great feel for what's going on around him. Especially when you're younger, that really stands out." Sam used that knowledge and even after missing several games as a sophomore, he learned from the experience and was anxious to go last year. He earned honorable mention All-Greater Metro Conference last year, while finishing first in 3-pointers (43), tied for second on the team in scoring (9.2 ppg) and was third on the team in free-throw percentage (.833), 3-point percentage (.355), rebounds (3.3 rpg) and assists (2.0 apg). Rohde had his first real exposure to the pressure of playing before a varsity crowd as a freshman when the Lancers played Germantown in a big non-conference game Wandrey recalled. "He won the Germantown-Brookfield Central JV game in front of 3,500 people with a running 7-8 foot shot at the buzzer against guys who were much bigger than him," he said. "I've never really played in huge basketball atmospheres like that," he said. "There were tons of people there for the varsity game. I never really experienced the energy, the crowd, all the crazy good athletes you're playing against. It took a little time to adjust, but it helped me out a lot." Playing those dozen games as a sophomore also helped prepare him for his junior season. "Varsity experience helps a lot," he said. "People don't realize the jump it is from freshman to JV to varsity. So if you already have a year under your belt, the game slows down for you." 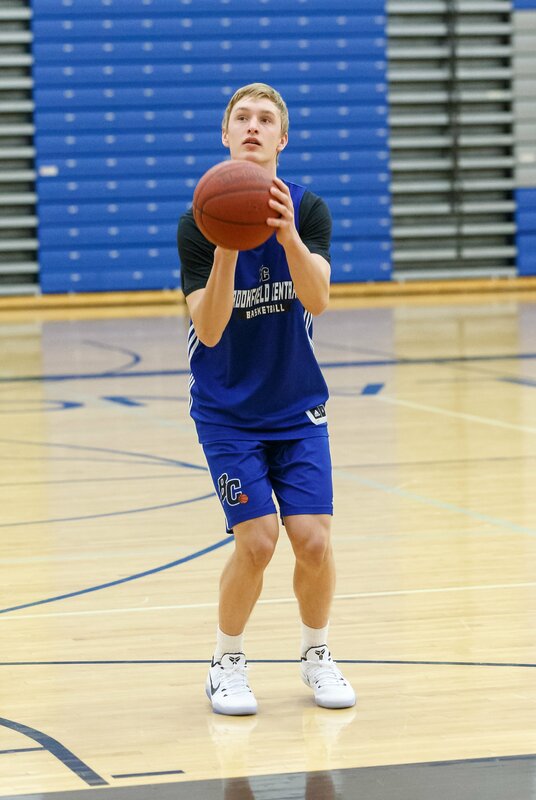 Ironically, the emergence of freshman Gage Malensek at point guard last year, allowed Rohde to move back to shooting guard, giving the Lancers perhaps the best backcourt in the conference. Wandrey talked about the switch in positions for Rohde last season. "It was kind of funny because he doesn't play point guard for us now - he's our third option (behind Malensek and Cole Nau, both sophomores)," he said. "Even though the injury set him back, he seems to know the right play, makes the right decision and he's a great shooter. "A couple games last year he hit 6 or 7 3's. He a lights-out shooter. He's improved dramatically defensively and he became a really good rebounder last year. He's a good ball handler, not a good dribbler. He doesn't turn it over. "And he has that higher level basketball IQ. I can sit and watch film and see it. You can tell kids don't put yourself in these positions and Sam doesn't. As a coach he's kind of guy who is really dependable." So it's not surprising that Rohde knows his strengths and weaknesses. "Perimeter shooting, positional defending, I'm a pretty smart player on both ends," he said, then adding "being a good teammate, encouraging my teammates. Mentally, I'm pretty good defensively. I know where guys are supposed to be. "But I need to work on my overall athleticism; lateral quickness for on ball defending. My decision-making could improve, my ability to help my teammates improve." Wandrey added one more factor. "He's almost unselfish to a fault. He needs to shoot the thing more often." After listening to Wandrey and Rohde talk, it is no surprise he is one of the team's captains and leaders this year. "I'm an encourager," Rohde said. "A leader should always be a great teammate first. Then it's kind of contagious with the other guys. Being a positive role model off the court. That's how we should perform in the classroom, the community." But Wandrey would like the soft-spoken Rohde to be a little more outgoing. "All the stuff outside of basketball skill he's a coach’s dream," the veteran coach said. "He's attentive, he's respectful. He's committed, he's loyal. But I'd like him to be a different type of leader. With his personality, he's not going to grab a guy by his shirt. He's not super vocal. "Two years ago when he was playing point guard, that was a big problem. I told him we need you to be vocal and tell these guys what the situation is." Rohde agrees with his coach, but he also knows who he is. "I need to be a leader," he said. "Working hard at practice, setting the tone every day for the expectations of everyone. I need to make it known what we expect of our team and help our teammates become a closer group to accomplish our goals. "I'm not extremely loud on the court, but I talk when things need to be said." It is not surprising that Rohde is a goal-oriented person. When asked what he wanted to accomplish he talked about personal and team goals. "I would like be a first-team all-conference selection," he said. "I want to be a more legitimate go-to threat and improve my ability to stop people on defense and not be the guy you put on the worst offensive player on the other team. "And I would also love to win conference (Central is the pre-season favorite) and put ourselves in the best position to make a run at the state tournament." When closing out the interview, Wandrey talked more about the likeable Rohde as a person. "Adults look at him and say I'd love my kid to be like that," he said. "The other kids realize he's a great kid, the example that he sets. He works hard. He's quiet, soft-spoken, reserved, awesome. "He is that kid who you don't have to worry about. He's responsible, makes good decisions. He's kind of like the boy next door you want your son to be like or your daughter to date. "He does everything the right way." FAVORITE MOVIE: Comedies and Action movies. FAVORITE PLACE YOU VISITED: Florida. WHAT DO YOU DO TO RELAX? Watch TV, Movies, Hang out with friends. FAVORITE SPORTS RIVALRY: Brookfield East. MOST MEMORABLE SPORTS MOMENT: Making State Tournament in soccer this fall. WHAT WOULD YOU LIKE TO DO IN THE FUTURE? Attend college. Play basketball if it presents itself.